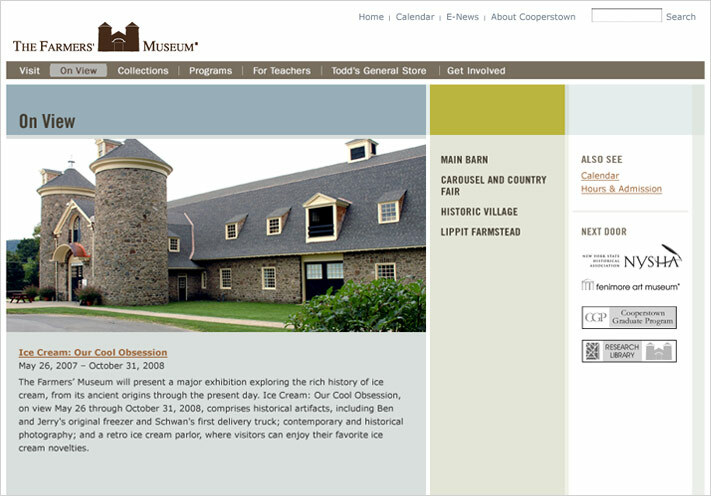 In this project, Cabengo designed four related websites for the New York State Historical Association (NYSHA), the Fenimore Art Museum, The Farmers’ Museum and the Distance Learning initiative. 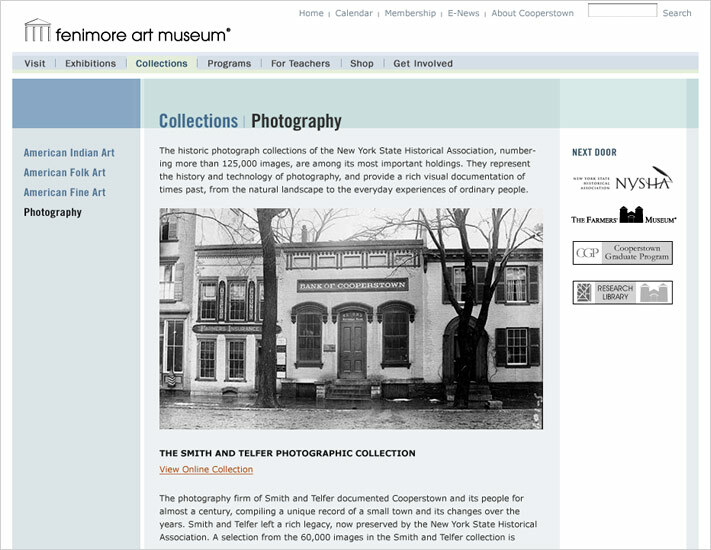 The challenge was to create a family of related websites that shared a sensibility and a common backend ­ but allowed for differences in design and content on the public front end to reflect each organization’s unique positioning. 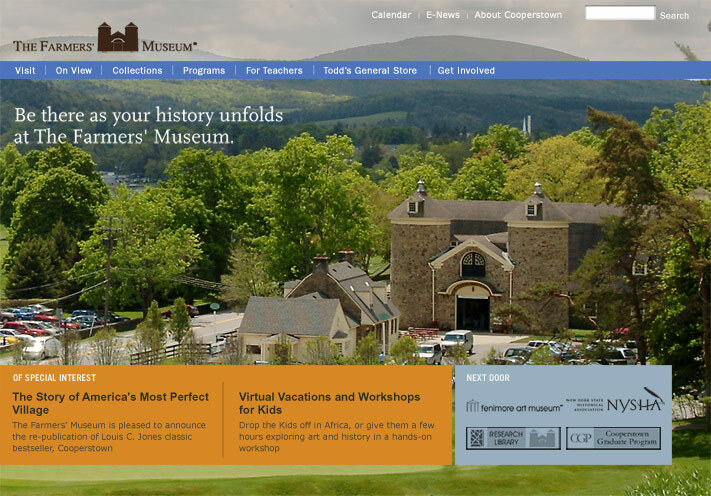 NYSHA, as a private, non-governmental educational organization, needed to be positioned as an active, relevant membership organization deeply involved in statewide education and a leading source for training history teachers in New York State. 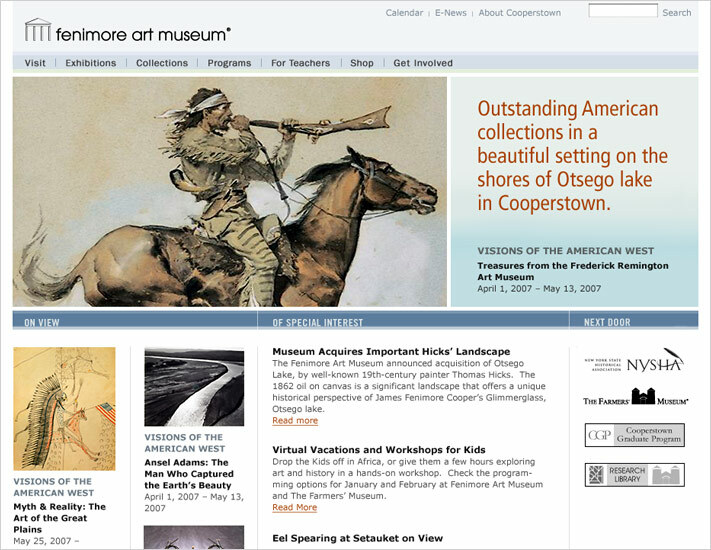 The Fenimore Art Museum, technically the “museum” part of NYSHA, houses one of the finest collections of American art, folk art and Native American art in the world. 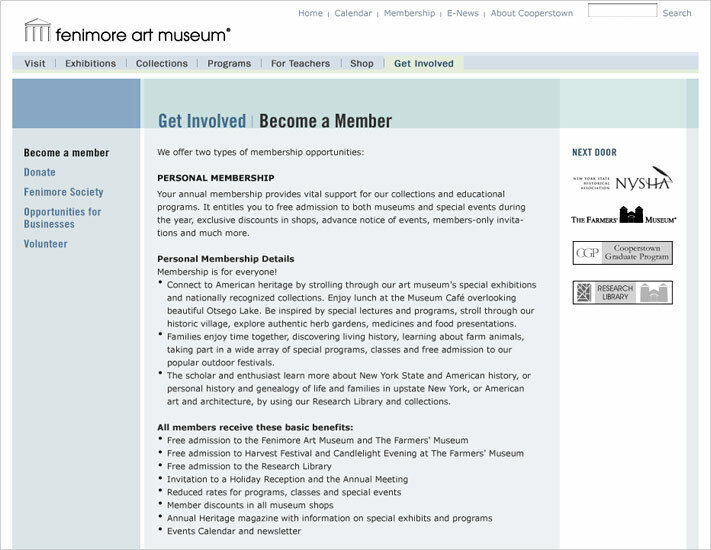 Its website needed to position the Fenimore Art Museum as an intimate regional museum with nationally significant collections. 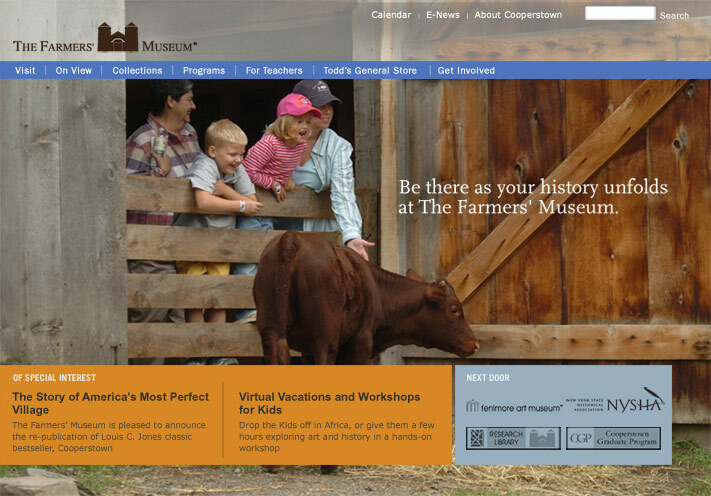 The Farmers’ Museum, an independent but closely affiliated private, non-governmental educational organization, is dedicated to rural life, agriculture, architecture, heritage and American traditions. 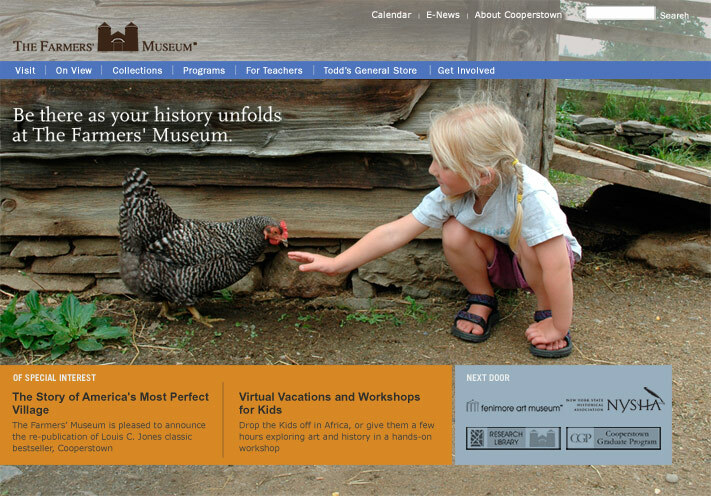 Its website needed to position The Farmers’ Museum as a leading living history museum that offers a uniquely personal and authentic experience of American heritage. 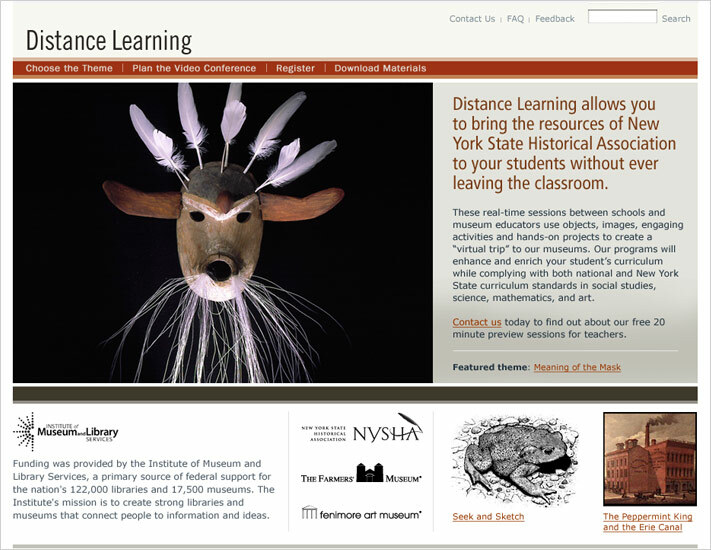 The Distance Learning website, linked to all three organizations, needed to serve all three organizations and fit comfortably within the family of sites. To meet these challenges, we developed an information architecture strategy that addresses each organizations distinct priorities and target audiences. 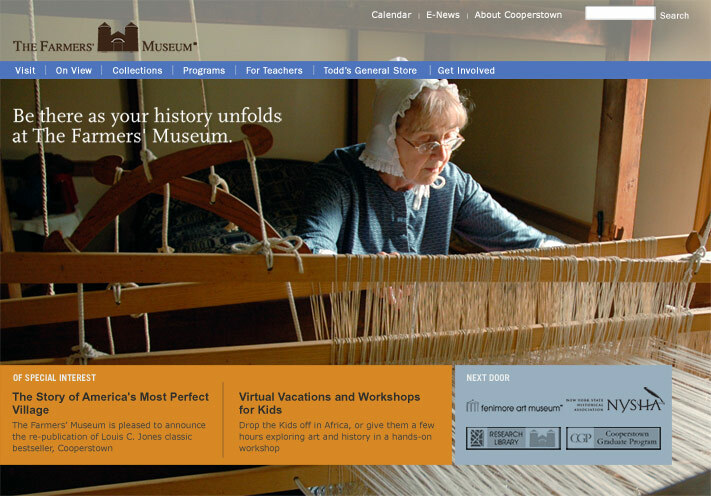 We developed a cross-linking strategy to cross-promote programs and products across sites. 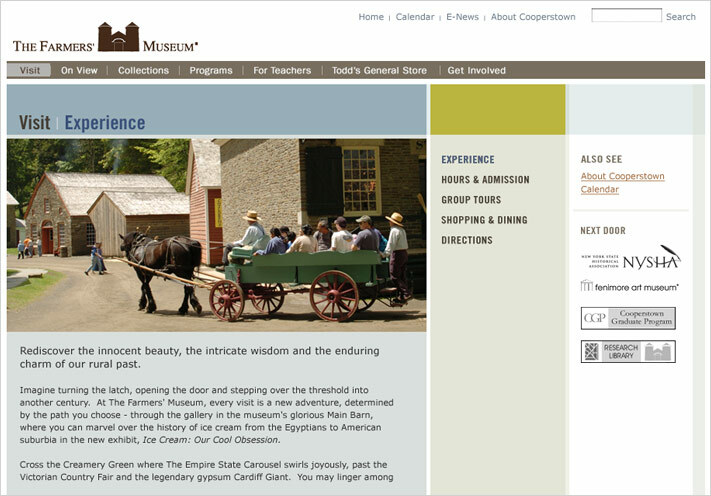 In an effort to present the museums as vital, active and inspiring, we used accessible, authentic narratives and beautiful images to market the “brands,” to tell each museum’s story. We incorporated tools to help facilitate the administration of offline activities, promote visitation, and generate revenue, such as event registration, membership, and shopping. To address content management needs, our development partner, Database Publishing Consultants Inc., implemented Drupal, an open-source CMS solution. The centralized content management system (CMS) enables non-technical staff in multiple departments to maintain dynamic content across all of the websites. The turnkey solution has allowed the client to maintain the system independently and internally after launch.